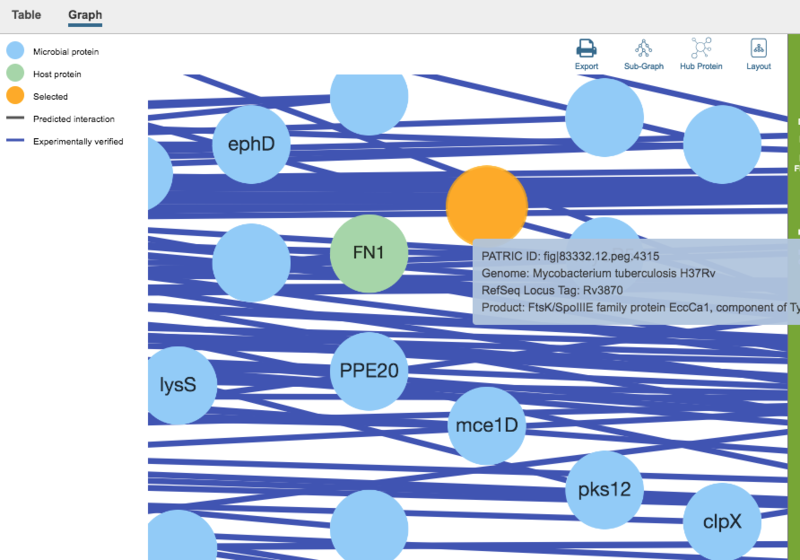 The Interactions Tab provides experimentally and computationally derived host-pathogen protein-protein interaction data and visualizations from more than 15 public repositories, including STRINGDB, with a total of 55 million protein-protein interactions. Interactions are available at both the genome and gene levels, and are presented in tabular and graph format. 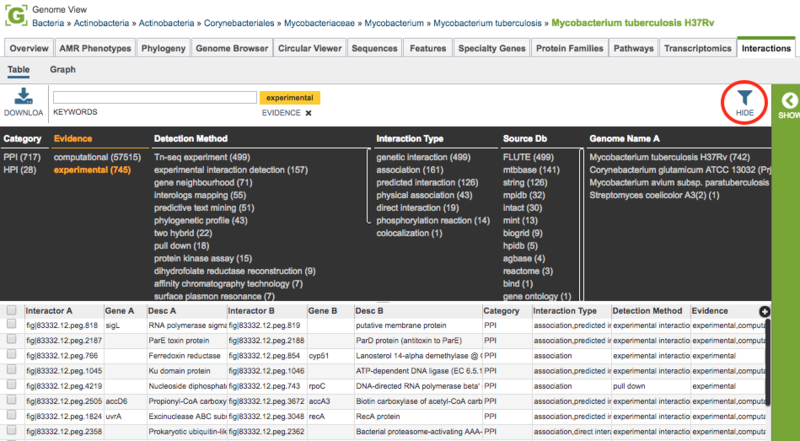 Clicking the Interactions Tab in a Genome View displays the Interactions Table, listing of all of the interactions in PATRIC associated with the genes in that genome. Interactor A: PATRIC ID (unique primary identifier) for one of the two interacting features (protein-coding genes). Gene A: Gene name for the feature, if available. Desc A: Protein product (functional annotation) associated with the feature. Interactor B: PATRIC ID for the other of the two interacting features. Gene B: Gene name for the feature, if available. Desc B: Protein product associated with the feature. Interaction Type: Interaction types, taken from the corresponding PSI-MI controlled vocabulary. Detection Method: Interaction detection method, taken from the corresponding PSI-MI controlled vocabulary. Rearrange and narrow the list of genomes in the table via sorting (using column headers), keywords (using the Keyword box), and filtering (using the Filters tool). Features: Loads the Features Table for the features corresponding to the selected interaction. 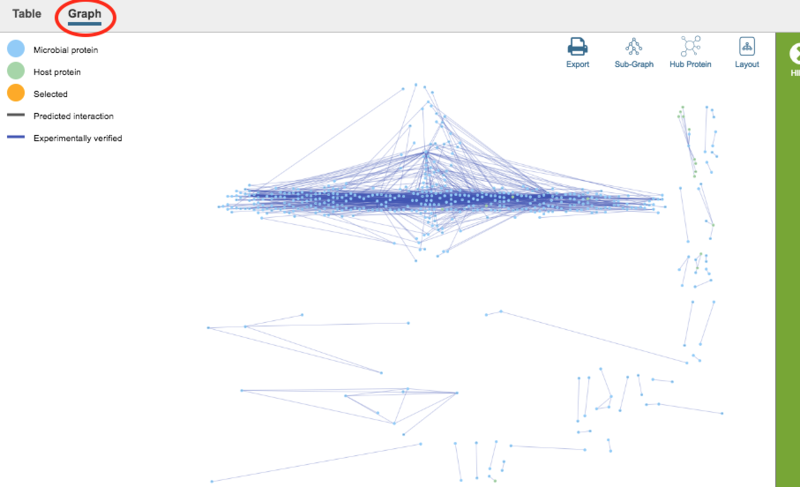 Clicking the Graph option at the top left of the table displays the Cytoscape-based Interactions Viewer. In the graph, proteins (interactors) are displayed as nodes and the interactions between the nodes are displayed as lines. Scrolling with the mouse zooms in/out in the graph. Clicking and dragging with the mouse moves the graph in the display. Gene names, where available, are displayed on the nodes. Mousing over a node or line displays detailed information about that interactor/interaction. Clicking and dragging on a node moves it in the graph, allowing rearrangement for better visualization. Export: Creates a png image file of the graph and makes it available for saving to disk. Subgraph: Auto-selects subgraphs with more than 5, 10, or 20 nodes, or auto-selection of the largest subgraph.